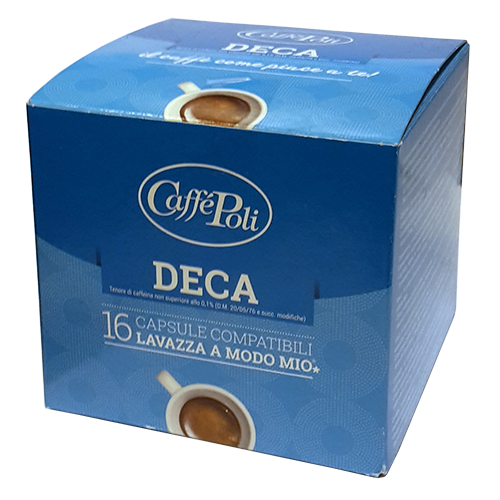 Caffè Poli A Modo Mio Deca coffee capsules are ideal for those who absolutely do not want to miss the pleasure of a real espresso but do not want to have caffeine. Decaffeinated coffee is perfect for those who are particularly sensitive to caffeine, but does not intend to give up the pleasure and the enjoyment of drinking coffee. The capsules contain a classic blend, with a delicate flavor and a rich aroma which is preserved thanks to a completely natural process that removes the caffeine. The high quality of the coffee is guaranteed by a 50 year old experience to roast and blend coffee.